Tom has been in public accounting for over 20 years and has extensive experience in the tax compliance of individuals, businesses and not for profit organizations. 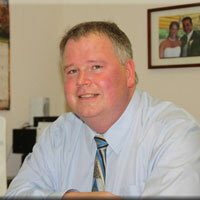 Tom began his career as a trust tax preparer for Maine National Bank in Portland and then spent 5 years as a staff accountant for a local Blue Hill CPA. After joining forces with his wife, Marilyn, who was operating Blue Hill Accounting, the business was able to expand to include tax services. Tom holds a Bachelors Degree in Business Administration with a concentration in Accounting and in his spare time enjoys playing golf, boating, music, collecting rare bottles and being with friends and family. Tom resides in Blue Hill with his wife Marilyn and his beloved cats.